Manufacturing efficiency is the ratio between the actual and standard output levels, expressed as a %. One of the most easily recognizable wastes in lean manufacturing is the production of Defects. Examples include waste such as scrap parts, products that require rework, or assemblies that are missing details. Defects are often considered to be one of the most significant manufacturing wastes because they can actually lead to the generation of additional wastes such as Overproduction, Transportation, and Excess Processing. Of all the wastes in manufacturing, Overproduction has, by far, the most negative impact on success. Overproduction occurs any time more parts or products are produced than the customer is willing to purchase. Like the production of Defects and subsequent Excess Processing, Overproduction can also lead to the generation of additional lean manufacturing wastes such as Waiting, Inventory, and Motion, consuming vast amounts of time and resources. A planned downtime (such as set up) is any event where the process is unavailable to run due to a pre-planned activity, such as a changeover or scheduled maintenance. Shops will often changeover jobs frequently, and this can be the biggest source of lost production time for a business. Setup times for the same job can vary wildly by operator, or by shift. Only by tracking planned downtimes like setup can this be improved. Unplanned downtime is downtime that occurs unexpectedly or as a result of a failure (for example, a hardware failure or waiting on appropriate materials to complete a task). When product waits, no value is being produced but the cost of overhead operations continues to grow, which strips potential profit from the sale. Waiting not only destroys material and information flow, but also generates excess Inventory. While it’s essential for any manufacturer to optimize the productivity of their existing assets (people and machines), many have no way to measure this productivity effectively. Thus, opportunities to improve asset performance are constantly lost. OEE measures how well an asset is performing by building availability, performance and quality into one key performance measure. Understanding how OEE relates to waste helps pinpoint waste generated by the 6 Big Losses (Breakdowns, Setup and Adjustments, Small Stops, Reduced Speed, Startup Rejects, Production Rejects) trouble spots that undermine the goal of lean manufacturing, with the goal of constantly identifying opportunities for improvement. 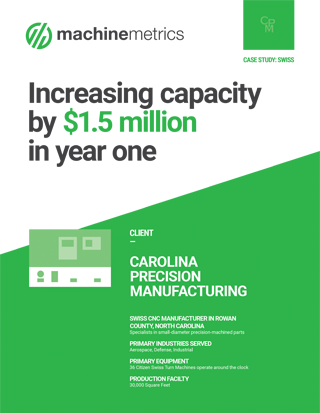 Our average first-year efficiency increase for precision metalworking shops? 20% What's the solution? MachineMetrics. MachineMetrics has simplified IoT for the shop floor: our fully automated machine monitoring solution provides visualizations of real-time manufacturing production data, instant notifications, as well as historical analytics, allowing factory workers to make faster, smarter, more confident decisions based on real-time data. Not only can you quickly identify and eliminate productivity drains in your existing production process, but you also gain access to additional data that can help you uncover “hidden” issues that could be negatively impacting your shop.